Dislcaimer: All figures reported here are approximations only due to multiple re-shipping, the presence of multiple fleets and killboards still synchronizing. YPW-M4 system, Insmother region. On the 12th of October at 18:40 EVE Standard Time, Red Menace Coalition (RMC) forces clashed with Drone Regions Federation (DRF) over a moon in the system, which escalated quickly into a Super Capital fight involving nearly a thousand players! DRF and RMC had been fighting a each other for the last few weeks, meeting in bloody sub-Capital brawls in and around the Insmother region. As often happens under the new Aegis Sovereignty system, the two sides met over a tower rather than a system, an Hafnium moon which belonged to Triumvirate. [TRI]. The tower was reinforced the previous day by RMC forces and the two sides were gearing up to fight over it. DRF assembled 2 fleets, a Proteus\Legion Strategic Cruiser fleet and a Machariel Battleship fleet. The two forces together had approximately 200 pilots. RMC had a 100 pilot Machariel fleet of their own with Triage Carrier support. RMC forces were first to arrive to the system, as it is located 1 jump from their staging system. They warped to the tower and quickly set up on it as it was coming out of reinforced mode, bringing in a small Dreadnought force to destroy the tower. DRF forces however were still en-route to the system. Once the tower was removed RMC Dreadnoughts were extracted while the sub-Capital fleet remained on grid, possibly waiting for DRF forces to engage them, or just waiting for a tower of their own to be brought down and installed. Though the tower was lost, DRF forces decided not to stand down, but to engage the RMC fleet. The DRF Strategic Cruiser fleet quickly entered through the Q7-FZ8 gate and warped on top of the RMC Machariels while the DRF Machariel fleet bridged into the system at a perch 200 kilometers off, starting the fight. As the two sides just started the brawl, a fourth fleet entered the fray, a 100 pilot Cerberus Heavy Assault Cruiser force belonging to Stain-Wagon Coalition (SW). The SW force bridged to the grid on a perch which was located a mere 140 kilometers from the DRF Machariels. The arrival of SW fleet further complicated matters, as SW is on friendly terms with RMC and came to support it. DRF forces quickly dropped a sizable Capital force comprised of Dreadnoughts and Carriers on top of the RMC Machariels. This force targeted the RMC Triage Carriers, annihilating them in rapid succession. This allowed the DRF Strategic Cruisers to take down the RMC Machariels, who without their Triage support simply melted at a fast pace, trading perhaps 5-6 Machariels for each Strategic Cruiser loss. Meanwhile the DRF Machariels were busy fighting the SW Cerberus fleet, losing a few ships to the Heavy Missile volleys but re-paying the favor five times over. Seeing their sub-Capital fleet facing annihilation, RMC Fleet Commanders decided to further escalate, bringing in their Super Capital fleet. 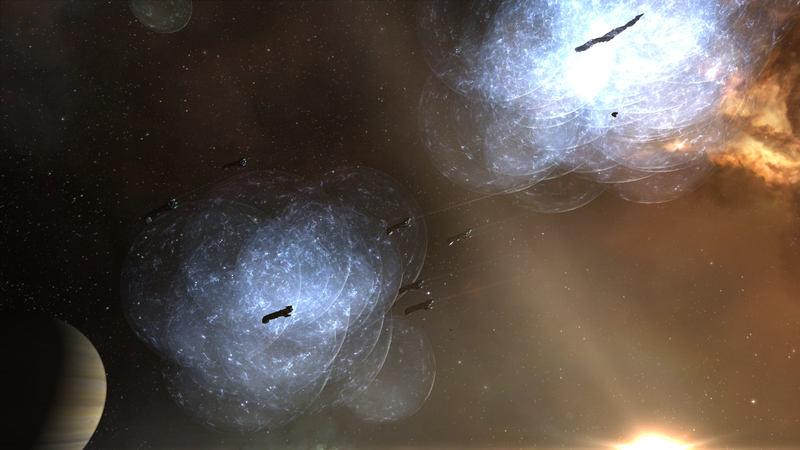 6 Titans and 18 Supercarriers were brought to the field in order to make short work of the DRF Capital force. This Super Capital force was quickly set loose on the DRF Capitals, who could offer little resistance against the onslaught of fighter bombers and doomsday weapons. However, the DRF Capital force already did its job of disposing of the Triage Carriers of the RMC’s Machariel fleet. With the SW fleet unable to remain on grid for long due to the DRF Machariels, the RMC sub-Capital force stood no chance. What followed was a massacre as RMC Machariels were overwhelmed by the combined firepower of the DRF sub-Capital fleets. At the same time, DRF Interdictors rushed over to the RMC Super Capitals and started bubbling them, calls made for DRF pilots to bring more Interdictors to the system. With the RMC sub-Capital force destroyed and the grid mostly secured by DRF forces, a decision was made to counter escalate. 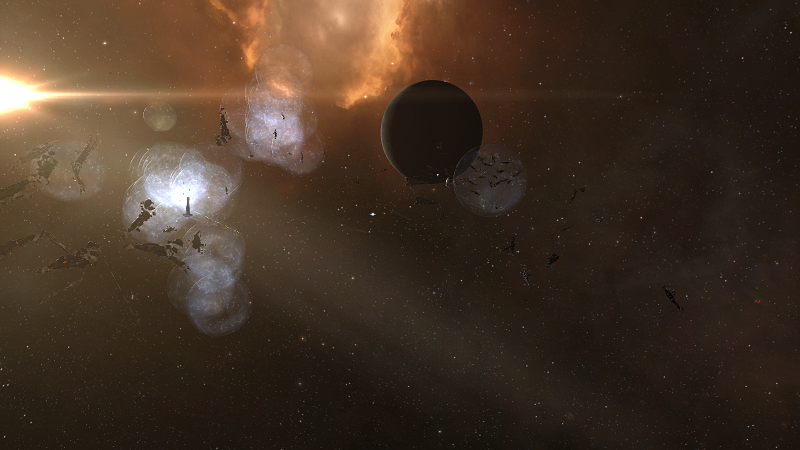 Quickly, the DRF brought 18 Supercarriers and 2 Titans in order to fight the RMC Super Capital force. SW fleet at this point focused mainly on attempting to clear Interdictors from the field in order to free the trapped RMC Super Capitals, only to be forced off again and again by DRF sub-Capitals. At the same time, Northern Coalition. [NC] was informed of what was occurring by DRF forces and formed a 90 pilot Proteus Strategic Cruiser fleet. Using Wormholes the fleet arrived to the system and linked up with DRF forces, helping to control the grid and fend off the dozens of gangs and other small fleets that had converged on the system as the news of the Super Capital engagement spread across New Eden. Pandemic Legion [-10.0] also arrived to the system, having heard of what was happening. Though strictly there to third party, it attempted to avoid confrontations with the DRF forces who seemed to control the grid, though the two sides exchanged fire as confusion and misunderstanding settled on the field. As this was going on, the two Super Capital forces engaged each other. The RMC Super Capital force quickly discovered it could not tank the incoming damage, while the DRF Super Capital force had a clear advantage with its sub-Capital force destroying the fighter and fighter bomber drones of the RMC Supercarriers, thus negating their damage. Worse yet, the RMC Super Capital fleet was a mix of both shield tanked and armor tanked ships, while the DRF enjoyed a single armor tanking doctrine. This meant that while all DRF ships could repair each other and tank unanimously, RMC ships could not tank as well even though they had equal Supercarrier numbers. As time went on, RMC Supercarriers and Titans started to succumb to the onslaught, being attacked both by a Super Capital force and no less than four large sub-Capital fleets, not to mention the hundreds of opportunist pilots that came to take part in the behemoths’ destruction. While a few RMC Titans and Supercarriers managed to slip away or get freed by the constant stream of sub-Capital reinforcements that poured in and was destroyed by the hostile fleets, the majority of the RMC Super Capital force was destroyed. RMC tried a last gambit to at least inflict some Super Capital losses on the DRF side by jumping in a moderate Dreadnought force, but the gamble failed and the Dreadnoughts were soon dispatched alongside any remaining RMC Super Capitals. Finally with no more RMC Capitals or Super Capitals present, DRF forces quickly extracted their own Super Capital force. At the same time, Pandemic Legion and Northern Coalition. forces quickly retreated from the system, prompted to render aid in another battle, thus leaving the DRF sub-Capital force to finish the mop up. SW forces had also withdrew during the confusion, leaving DRF to claim victory. With another fight brewing on the horizon, DRF forces extracted as well, ending hostilities in the system. Battle report for the YPW-M4 system can be found here. All told the battle lasted nearly 3 hours with local estimated at around 1000 pilots at the peak of the fighting and Time Dilation contributing much to the battle, swaying widely and reaching 10% levels at times. RMC lost the majority of the ships; 2 Titans, 8 Supercarriers, 11 Dreadnoughts, 6 Carriers 117 Battleships and so forth. 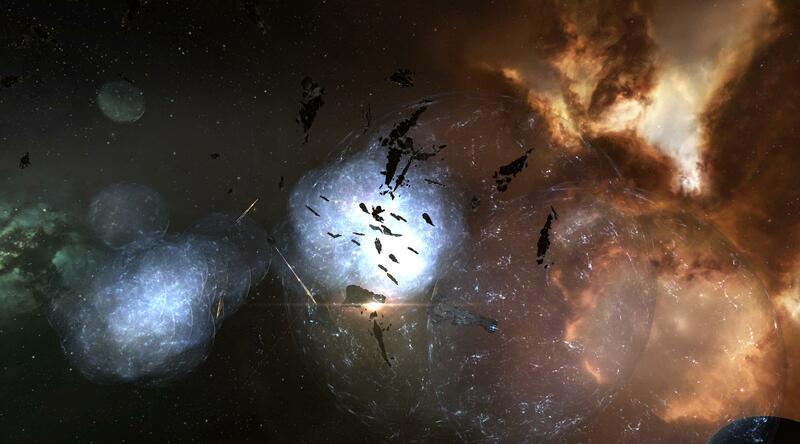 Alongside SW forces the death toll reaches 381 ships for a total of 610.13 Bil ISK damage. DRF forces lost 11 Dreadnoughts, 3 Carriers, 9 Battleships, 19 Strategic Cruisers and so forth. The total of ships lost reaches 162 hulls for 71.26 Bil ISK damage. It is in point of fact a nice and helpful piece of information. I?¦m satisfied that you shared this useful information with us. Please keep us informed like this. Thank you for sharing. I have a blog site with blog owner. I have registered my blog site utilizing a gmail account. Now, I intend to make use of a brand-new gmail account as well as I wished to import my whole blog site together with the articles and also remarks to this brand-new gmail id … Please inform me, is this feasible and also just how can it be done?. certainly like your web site however you have to check the spelling on quite a few of your posts. Many of them are rife with spelling issues and I in finding it very troublesome to inform the reality however I will certainly come back again. Magnificent goods from you, man. I’ve have in mind your stuff prior to and you’re simply extremely fantastic. I really like what you’ve acquired here, certainly like what you’re saying and the way in which during which you assert it. You’re making it entertaining and you continue to care for to keep it wise. I can not wait to learn far more from you. This is really a great site.